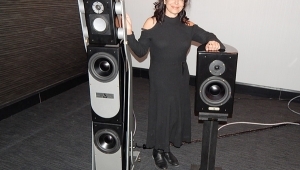 I started my Sunday by visiting Plurison, the Canadian distributor for Focal, Naim, Rega, Musical Fidelity, Devialet, Music Hall, Wharfedale, Cambridge, Astell&Kern, and others (and, under the name Audio Plus Services, the US distributor for some of those same brands). 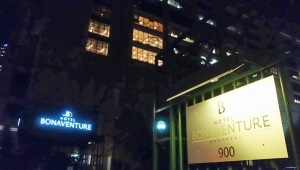 As they did last year, Plurison set up shop in the Ville-Marie roomone of the Bonaventure's largest, having been carved out of what used to be the hotel's main restaurantand presented their products in a mix of active and static displays, with a degree of visual refinement that few other exhibitors matched, and none exceeded. 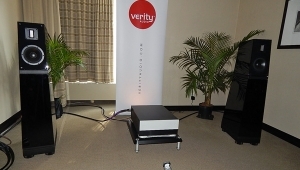 Also in this system were two new products from Musical Fidelity: their new, nuvistor-enriched Nu-Vista Vinyl phono preamp ($CAD3799), boasting fully five inputs, each with its own regulated power supply; and the M8 encore 500 ($CAD9999), which combines a 500Wpc class-AB integrated amplifier with a CD player, 2TB of internal disc storage, a UPnP-compatible file player, with Tidal streaming. 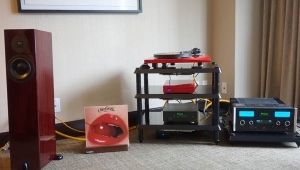 The system also included a Clearaudio Innovation Basic turntable ($CAD7995), Rega Planar 6 turntable ($CAD2799 with tonearm), and a Music Hall MMF 2.3 turntable ($CAD749 with tonearm). 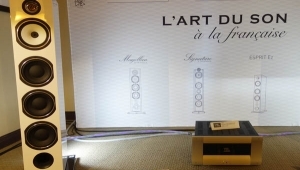 Another eye-catching display: this under-glass sample of the Devialet Phantom loudspeaker, available as the Phantom Basic ($US2000 each), Phantom Silver ($US2500 each), or Phantom Gold ($US3300 each), all with built-in D/A processors and class-D amplifiers, with power outputs ranging up to 3000W for the Phantom Gold. Devialet's canned demonstrationa loop that replayed time and againwas overbearing, beginning as it did with the sound of a very loud F1 motor, morphing into some horrid, overprocessed dance-music junk. On the other hand, I confess to really loving the veiled, crowned, medieval ghost-queen thing that Devialet puts in their promotional materials for the Phantom. So it's a draw. 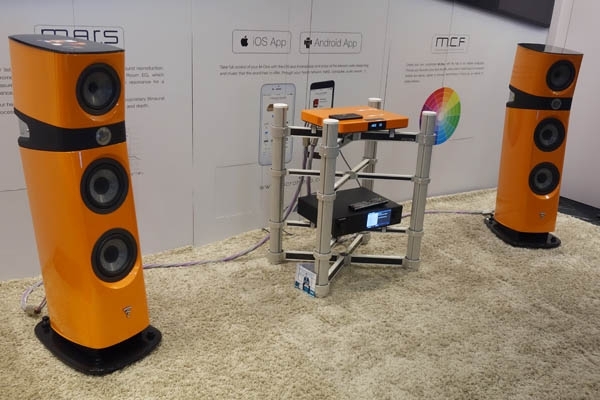 Before leaving the Plurison area, I happened upon this little number from their pro-audio division: the Focal Trio6 Be Professional Monitoring System ($US2799 each)a powered loudspeaker that Plurison was using for sound reinforcement purposes. Also in the system were a 22" Mapex bass drum with Remo head and Mapex speedpedal, and . . . nah, just kidding! You know a system is good when you're standing in the hall listening to a violin concerto and think: Milstein!and then go inside the room and discover that the soloist on the record really is Milstein. 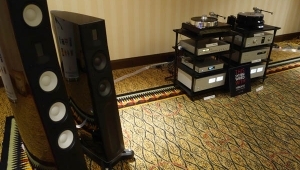 So it was in Son Ideal's generously sized demonstration room, where I relaxed with a system built around the Harbeth 30.2 Anniversary loudspeaker ($US6495/pair), including a Luxman PD-171A turntable with tonearm ($CAD6995), Luxman D-05u SACD/CD player ($CAD4995), and Luxman L-509x integrated amplifier ($CAD9495). 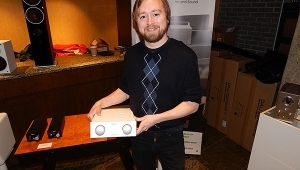 Beck sounded great on this system, too. 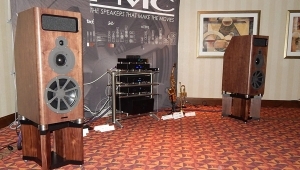 ... the matching CL-38uSE preamp. If the pair does show up at chez AD, make an offer to buy them. They were produced in a limited edition of 100 and Ken Kessler regrets returning his review samples. 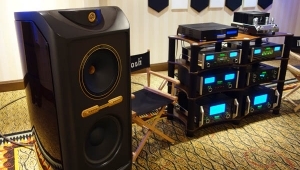 You should try them with the Harbeth 30.2 Anniversary speakers. Was it a Cannondale bicycle with the color-shifting paint that once caught your fancy? 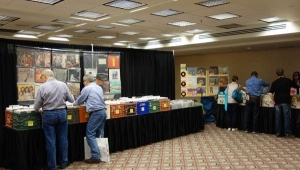 Love Luxman and that you often review their equipment. 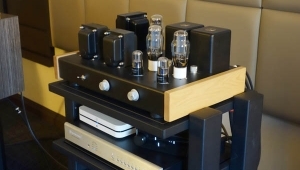 If I didn't have a kid in college, I'd have one of their tube integrated amps or tube preamps in a heartbeat.